A CRYSTOBAL’s medium-sized, Victorian era Vampire Killing Kit, JEZABELLE is a prime example of the workmanship that goes into the artist’s works. This kit incorporates four bottles; one with rock salt, one with consecrated earth, and two for holy water. Three of CRYSTOBAL’s trademark “cross stakes” with leather X binding are the focal point. 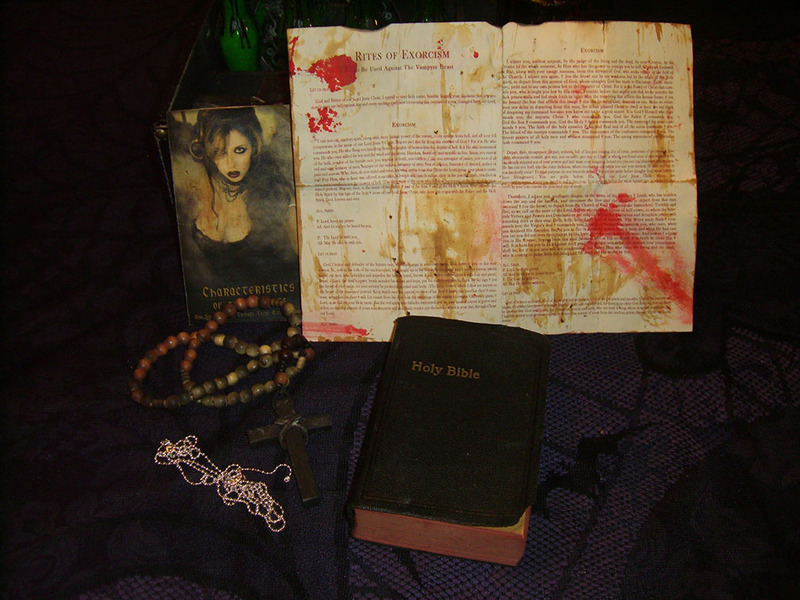 This vampire hunter’s kit also included an actual vintage bible, hand made rosary, and dagger. The Exorcism Rites have been splattered with blood. This Vampire Killing Kit is made to look as though it was built by hand in the mid to late 1800s. The box of the Vampire Killing Kit has been hand-antiqued using CRYSTOBAL’s secret methods. The aging is done entirely by hand. The antique-style cross stakes are hand-cut and sharpened, and look like they have had 100+ years of use. The humpback chest that is used for the vampire killing kit is decorated with coffin nails (a CRYSTOBAL original concept) and small wooden cross stake. This Vampire Killing Kit was built in the mid 2000’s. It went for $856 at auction. Click the link to learn more about the artist CRYSTOBAL. Click the link to learn more about what a vampire killing kit actually is, and a little about its history.